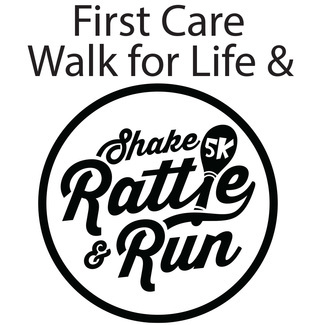 Our APRIL 6, 2019 Walk for Life & 5K Run supports the life-saving work of First Care Women's Clinic. Join us for some Shake, Rattle, & Run Fun! Sign up for your preferred volunteer area below. Please take note of the specific time slots for each area. Some areas are ONLY for adults, FCWC Staff or FCWC Board Members. Please be aware of this when signing up. Contact Michele Ly at [email protected] for any questions. Thank you! What to wear: Wear sneakers or comfortable closed-toed shoes (old shoes are recommended). Bring sunscreen, a hat, sunglasses, a friendly smile and wear comfortable clothing. Volunteers will receive a vintage 5K/Walk t-shirt at volunteer check-in, while supplies last. Where to go: Enter John Prince Park at the Prince Drive entrance off of S. Congress Avenue. Go to John Prince Park Center Drive Pavilion. Parking personnel will direct you, unless you arrive super early. Arrive by 5:55am for instructions. Manage volunteer sign in & out. Give directions to volunteers for area assignments. Includes "team captains" check in. Some HEAVY lifting. Involves moving ice bags, lifting boxes, setting up tables, hanging banners, etc. Arrive by 6:00am for instructions. 5K pre-registered check in. Same day check in. FCWC Staff/Board Members ONLY. Smile & have fun! Arrange food/drink. Keep food/drink bins full throughout event. FCWC Staff or Prior Experience ONLY. Check-in teams captains and manage sign making area. Must be willing to take a 1 hr online training class in advance, date & time TBD. Prior experience preferred. Set up water stations. Hand out waters to runners/walkers. Clean up water station areas when finished. Maraca shakers along path of 5K & Walk. Hand out 5K finisher medals after race. Fire confetti cannons at walk start. Assist in taking photos of runners/walkers with their phones at photo op area. 5K Awards Booth Leader (8:00-9:00am). FCWC STAFF ONLY. Hand out age group place awards to 5K finishers. Involves HEAVY lifting, moving & carrying boxes, taking down & rolling banners, picking up trash, picking up & disassembling yard signs, loading the van, etc.